The results after nineteen races on sixteen weekends determined the 2013 IndyCar Champion. The series opened in late-March at St. Petersburg and ended at Auto Club Speedway in mid-October. The Championship had a good mix of ovals, temporary street circuit and road courses. The series continued to use the Dallara DW12 which was introduced in 2012 to replace the Dallara IR5. The philosophy behind a spec car was to control costs ($349,000/chassis). The DW12 also incorporated many new safety features – most obvious was the bodywork surrounding the rear tires. The DW designation was in honour of the late Dan Wheldon, who had performed much of the testing on the new car. There were two manufacturers providing engines for the season – Chevrolet and Honda. The twin-turbocharged engines produced approximately the same horsepower – 550-700-hp depending on the turbo boost. Rounds twelve and thirteen were held at Toronto’s Exhibition Place and the event was called the ‘2 IN T.O.’ weekend. The races would be eighty-five laps around the 1.755-mile eleven-turn temporary street circuit. Making this event unique was the introduction of the first standing start in IndyCar Series history. It did not turn out as planned when Josef Newgarden had an engine sensor malfunction on the grid. The forced officials to implement a rolling start. The series had better luck with Sunday’s standing start. 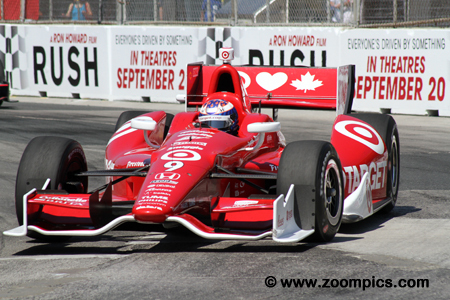 Scott Dixon started fifth in race one for Target Chip Ganassi Racing and passed race leader Sebastian Bourdais on lap-78 to score his thirty-first Indy car victory – he was the first driver back-to-back winner in 2013. On day two Dixon started on the pole and led eight-one laps for a sweep in Toronto. With three-consecutive wins, he was now second in the points. 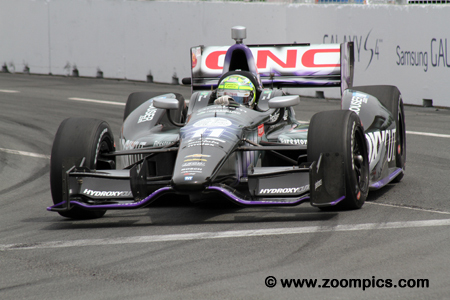 In race-one, Sebastian Bourdais finished second which was the best result for a Chevrolet powered car. Bourdais started from the second position and led for a total of twenty laps – his second was the best finish in the IndyCar series for Dragon Racing. The following day Bourdais qualified second and ran an excellent race to earn the final spot on the podium. Dario Franchitti won the pole for the first race and was third at the checkered flag. However, he was assessed a twenty-five-second penalty for last lap contact with Will Power which dropped him to thirteenth. Upon review of data and video his third was reinstated by the series officials. On Sunday, Franchitti started second but a poor start and an incident with Helio Castroneves dropped him down the field, however, he was able to fight back and finished fourth. 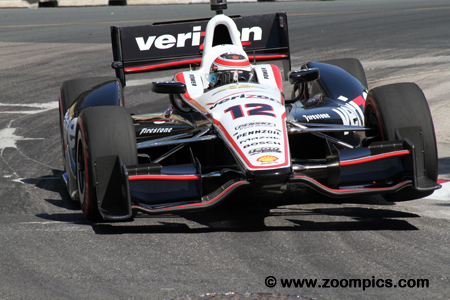 Series points leader, Helio Castroneves started seventh and finished six in Saturday’s race. This result increased his points lead over Ryan Hunter-Reay. 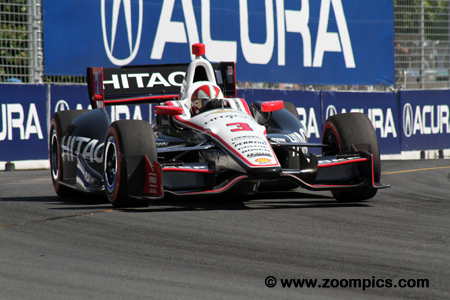 Race two would be more eventful for Castroneves as he made contact with second fastest qualifier Dario Franchitti. He was able to overcome this incident and was second at the checkered flag. 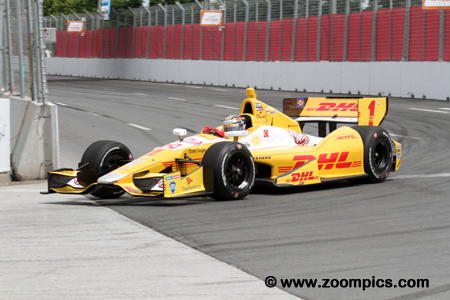 Defending race winner and series champion, Ryan Hunter-Reay was quickest of the Andretti Autosport drivers. He qualified in the sixth position for race-one but had a miserable race which included a couple of bad pit-stops and an incident in turn-three – he finished eighteenth. Sunday was worse for Hunter-Reay. He started fourth but retired on lap-84 after contact with Will Power. 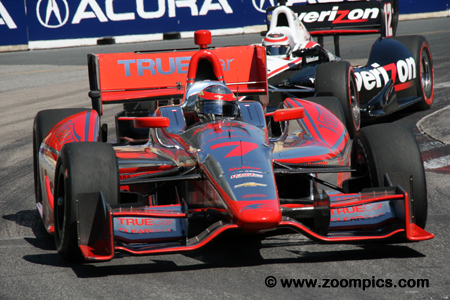 Third place starter Will Power had contact in turn-three while battling with Dario Franchitti for third. Power came out on the losing end and finished a lap down to the leader in fifteenth. On Sunday, Power had another incident – this time with Ryan Hunter-Reay. While contesting fourth, he made contact with Hunter-Reay. After starting fifth, he finished eighteenth. 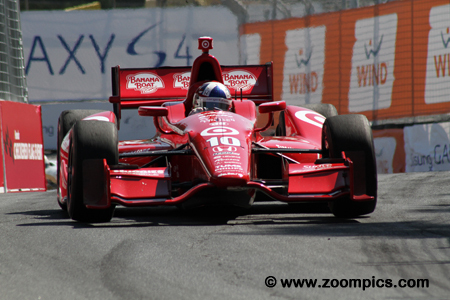 The 2013 Indy 500 winner, Tony Kanaan, qualified fourth for race one in Toronto. A combination of a slow pit-stop and poor restarts dropped him to a fifth place finish. Sunday’s did not go will for Kanaan. During the morning warm-up, he damaged the left-side of the car which forced the crew to make repairs. And, the race did not get any better. He was the first retiree after contacting the wall with the right rear tire on lap-36. 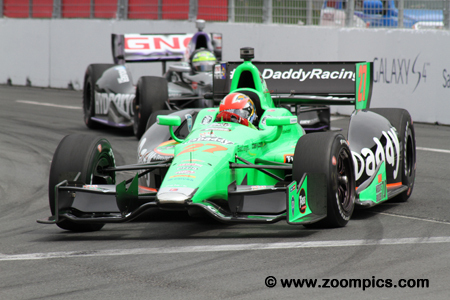 In race-one, Marco Andretti was the best of the four car Andretti Autosport squad. Andretti qualified tenth and moved to fourth after the race’s fourth restart. He was unable to match his performance in Sunday’s race – he qualified seventeenth and finished ninth. 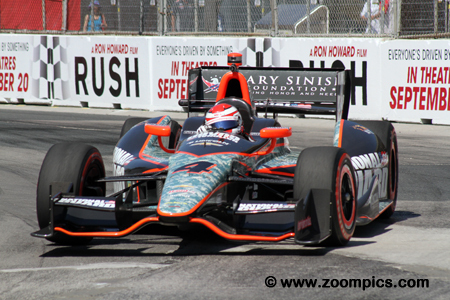 Local favourite, James Hinchcliffe, started from the thirteenth grid spot in Saturday’s race and finished eight. 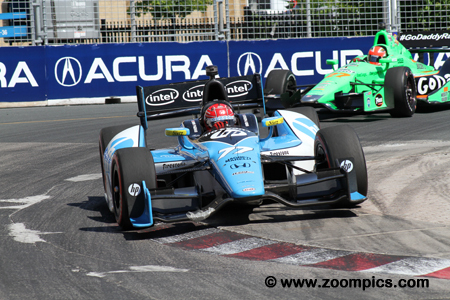 To date, this was Hinchcliffe’s best result in Toronto. The second race was a disappointment for Hinchcliffe. He suffered a throttle issue on the warm-up and pitted which left him four-laps down to the leader. The winner at San Paulo would finish twenty-first. Detroit winner, Simon Pagenaud started Saturday’s race twelfth and despite brake problems, the Schmidt Hamilton Motorsports driver finished ninth. 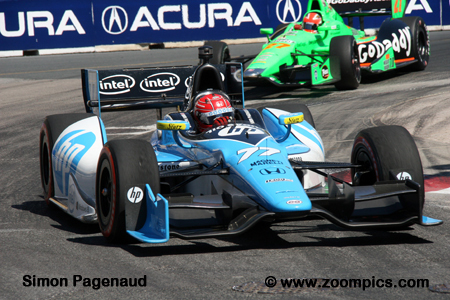 The following day Pagenaud had to deal with another issue. During the first pit-stop, there was a problem refueling the car which put him a lap behind the leader. He was able to get the lap back and finished where he qualified – twelfth. 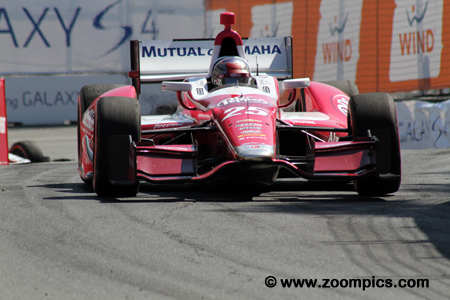 It was a difficult weekend for Rahal Letterman Lanigan driver Graham Rahal. In race one, Rahal qualified eighteenth and passed a number of cars before he was hit by Tristan Vautier which contributed to his twentieth place. In the second race, he fared better but still finished a lap down to the leaders in thirteenth. Ryan Briscoe was gridded ninth in the first race but retired after an accident in turn-five with Justin Wilson and Charlie Kimball. Briscoe injured his wrist as the result of the contact and replaced by Carlos Munoz for Sunday’s race. Rookie Munoz started from the twenty-fourth position (last on the grid) and finished seventeenth.